File - In this Friday, Jan. 2012 file photo former dictator Jean-Claude 'Baby Doc' Duvalier, with his longtime companion Veronique Roy (with sun glasses), departing from the parking lot of the court house, where he had to appear before Investigative Magistrate Carves Jean to explain his many unauthorized visits outside of Haiti's capital city of Port-au-Prince. Investigative Magistrate Carves Jean holds out the case report of former dictator Jean-Claude 'Baby Doc' Duvalier. PORT-AU-PRINCE, Haiti (AP) — A Haitian judge said Monday that former dictator Jean-Claude Duvalier should face trial for corruption, but not the more serious charges of human rights violations committed during his rule. Investigative Magistrate Carves Jean said the statute of limitations had run out on the human rights charges but not on the accusations of misappropriation of public funds. He did not explain his reasoning, but the once-feared ruler known as "Baby Doc" is widely believed to have used money from the Haitian treasury to finance his life in exile. Jean did not release the verdict, based on a yearlong investigation, saying it must first be reviewed by the attorney general as well as by Duvalier and the victims of his regime who filed complaints against him. The judge said he recommended that the case be heard by a special court that handles relatively minor crimes. Duvalier, who has been free to roam about the capital since his surprise return from exile last year, would face no more than five years in prison. Duvalier attorney Reynolds Georges, who had argued that the case should be dismissed in its entirety because the statute of limitations had expired on all the charges, said he would appeal the decision as soon as he received the paperwork. "We're going to appeal that decision ... and throw it in the garbage can," Georges told The Associated Press. Duvalier has posed a challenge to Haiti since his return home from 25 years in exile, which he had spent in France. Haiti has a weak judicial system, with little history of successfully prosecuting even simple crimes, and the government is preoccupied with reconstruction from the devastating January 2010 earthquake. A majority of Haitians are now too young to have lived under Duvalier but many still remember his government's nightmarish prisons and violent special militia, known as the Tonton Macoute, which killed and tortured political opponents with impunity. More than 20 victims filed complaints shortly after Duvalier's return. Some were prominent Haitians, including Robert Duval, a former soccer star who said he was beaten and starved during his 17 months of captivity in the dreaded Fort Dimanche prison. On Monday, Duval said he was stunned when he was notified about the judge's decision and unsure if he planned to file an appeal. "I don't understand how he could've done that," Duval said by telephone. "If that's the case, that's an outrageous decision." Since its inception, the case has stumbled along. Prosecutors have been fired and the defendant has made few court appearances, despite pressure from advocacy groups saying a successful prosecution would mark a turning point for Haiti's weak judiciary. The United Nations peacekeeping force in Haiti said it was eager to see the case go toward a trial but Western embassies in Port-au-Prince, including the United States, remained largely mum on the matter, saying it was up to the Haitian government. For his part, Haitian President Michel Martelly gave mixed signals. Last week, the first-time politician recanted a suggestion from a day earlier that he might be open to a pardon for Duvalier, citing a need to end internal strife that has long dogged the country. A presidential adviser said, "A Duvalier pardon is not part of the agenda." The Martelly administration did little to put Duvalier critics at ease when it filled its ranks with former officials from the Duvalier era and grown children of members of the former dictator's inner circle. Meanwhile, Duvalier traveled around the capital and countryside, hobnobbing with friends, dining at high-end restaurants and even attending a memorial service for the victims of the 2010 earthquake. The judge, Carves Jean, threatened to arrest Duvalier this month because he was allegedly violating the terms of his release. An international advocacy group that has helped push for a trial, Human Rights Watch, called on Monday for an appeal of the judge's decision. "Those who were tortured under Duvalier, those whose loved ones were killed or simply disappeared, deserve better than this," Reed Brody, counsel for Human Rights Watch, wrote in an e-mail. "This wrong-headed ruling must be overturned on appeal if Haitians are to believe that their justice system can work to investigate the worst crimes." PORT-AU-PRINCE, Haiti - (AP) -- Human rights groups harshly criticized a Haitian judge Monday after he recommended former dictator Jean-Claude Duvalier face trial only on corruption charges -- and not for rights abuses during his brutal 15-year rule. The organizations, both Haitian and foreign, said Investigative Magistrate Carves Jean ignored critical testimony that would've given weight to a prosecution of the once-feared ruler known as "Baby Doc" for crimes that include torture, false imprisonment and murder. "The Haitian people deserve their day in court to prove Duvalier's culpability, which is an essential part of any meaningful reconciliation process," said William O'Neill, director of the Conflict Prevention and Peace Forum. Mario Joseph, a lawyer whose Haitian-run firm is representing some of the Duvalier regime's victims, said the judge "made so many errors" that they compromised his pre-trial investigation. He said the judge disregarded testimony from eight people who wanted to file complaints alleging torture and false imprisonment. 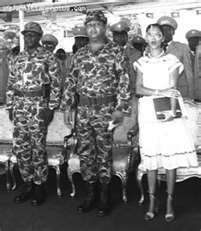 Jean decided that Duvalier should go before a special court that handles relatively minor crimes. Duvalier, the former "president for life" who has been free to roam about the capital since his surprise return from exile last year, would face no more than five years in prison if convicted in that court. Jean said the statute of limitations has run out on any human rights crimes committed during Duvalier's 1971-86 regime but not on accusations of misappropriation of public funds. He did not explain his reasoning, although Duvalier is widely thought to have used money from the Haitian treasury to finance his life in exile. The judge declined to give reporters a copy of the 20-page order that he held in his hands in his office at the courthouse. The decision, based on a yearlong investigation, must first be reviewed by the attorney general as well as by Duvalier and the victims of his regime who filed complaints against the former leader, Jean said. Duvalier's lawyer, Reynold Georges, had argued that all charges should be dismissed, and he said he would appeal Jean's finding as soon as he received the paperwork. "We're going to appeal that decision ... and throw it in the garbage can," Georges told The Associated Press. "I'm very sorry he did that -- everybody will condemn this decision." Human Rights Watch, which has helped push for a trial, also called for an appeal -- to overturn the judge's decision against a trial on abuse charges. Brody and O'Neill both argued the statute of limitations hasn't expired on alleged rights violations because they wouldn't take effect until the victims' whereabouts or people who disappeared under the regime were identified. O'Neill added that if the decision isn't appealed, he hopes to see the case taken to the Inter-American Court of Human Rights. Last May, the Inter-American Commission on Human Rights urged Haiti's government to "investigate and punish those responsible for the numerous violations of the right to life and physical security." Amnesty International researcher Gerardo Ducos said he was puzzled by the judge's findings, saying the "investigation was a sham and its conclusion a disgrace." He said that only a handful of victims were interviewed and that there was no effort to collect testimony from victims and witnesses outside Haiti. Others said Haiti has an obligation under international law to put Duvalier on trial. "Just as courts in Chile and Argentina have addressed past atrocities by their former military dictators, Haiti's courts are fully capable of bringing Duvalier to trial, and of seeking international support to do so, if needed," said James A. Goldston, executive director of the Open Society Justice Initiative. Duvalier has posed a challenge to Haiti since his return from 25 years in exile in France. Haiti has a weak judicial system, with little history of successfully prosecuting even simple crimes, and the government is preoccupied with reconstruction from the devastating January 2010 earthquake. 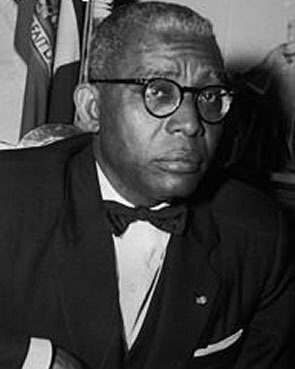 A majority of Haitians are now too young to have lived under Duvalier, who was only 19-years-old when he was tapped by his feared father, Francois "Papa Doc" Duvaler, to assume the presidency. But many still remember his government's nightmarish prisons and violent special militia, known as the Tonton Macoute, which killed and tortured political opponents with impunity. On Monday, Duval said he was stunned when he was notified about the judge's decision. The United Nations peacekeeping force in Haiti said it was eager to see the case go to trial, but Western embassies in Port-au-Prince, including the United States, remained largely mum on the matter, saying it was up to the Haitian government. Haitian President Michel Martelly gave mixed signals. Last week, the first-time politician recanted a suggestion from a day earlier that he might be open to a pardon for Duvalier, citing a need to end internal strife that has long dogged the country. Presidential adviser Damian Merlo said, "A Duvalier pardon is not part of the agenda." On Monday, Merlo declined to comment. Presidential spokesman Lucien Jura didn't answer his cellphone. The Martelly administration has made Duvalier critics uneasy by filling its ranks with former officials from the Duvalier era and grown children of members of the former dictator's inner circle. Since his return, Duvalier has traveled around the capital and countryside, hobnobbing with friends, dining at high-end restaurants and even attending a memorial service for the victims of the 2010 earthquake. Jean, the investigating magistrate, had threatened to arrest Duvalier this month because he was allegedly violating the terms of his release. Why others, too, must face the bar of justice if the trial of former dictator Jean-Claude 'Baby Doc' Duvalier for grand-scale public thievery is not to be perceived as a charade? *Less than two years ago, there was indeed one man who questioned his fortune, as the majority of Haitians continued to endure abject poverty. In fact, the questioning of his fortune occurred during a radio interview when Aristide was a guest of Jean Leopold Dominique, Haiti's then-best-known journalist. Unfortunately, the prominent radio journalist and activist is no more. He was brutally murdered in the early morning of April 3, 2000 in the front yard of his Radio Haiti Inter station. More: Why back Haiti's corrupt dictator? *Putting Former Haitian Murderous Dictator Aristide in Tight Handcuffs and Chains, Whose Job is That? 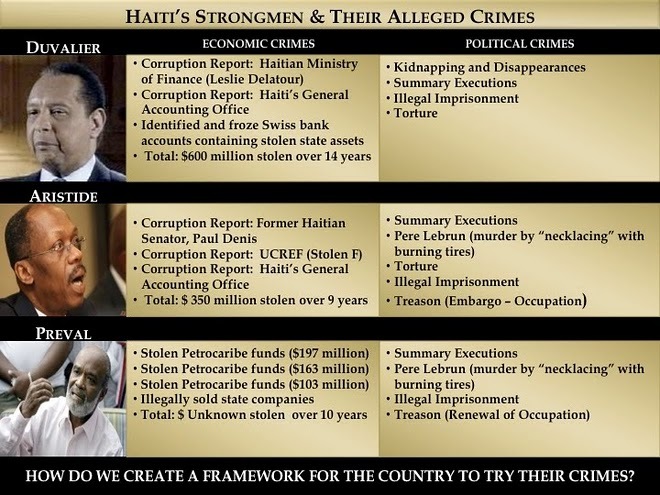 WeHaitians Library for more alleged economic and political crimes committed by Haitian leaders.